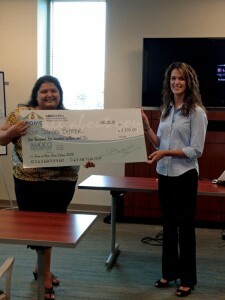 A MOCO Federal Credit Union’s Earn or Burn Home Edition announced Sandra Behmer as their $2,500 winner. Over the past eight months AMOCO has hosted a seminar series about the process of purchasing and financing a home. Behmer along with 17 others attended all eight seminars which placed them into a drawing for $2,500. Financial education combined with guidance and assistance from AMOCO Federal Credit Union is the first step towards financial freedom. Those interested in learning more about the Earn or Burn Home Edition seminar series should contact Jennifer Demers at (281) 534-5511. AMOCO Federal Credit Union is a member-owned financial organization. AMOCO‘s mission is to “serve and satisfy its members” and has done just that over the past 70 years. For more information please visit www.AMOCOfcu.org or call Jennifer Demers, business development specialist at 281.534.5511.